Decorating your house for Valentine’s Day doesn’t have to be a costly or time-consuming process. Sometimes the best holiday trimmings are ones you make at home. Spend an afternoon with your children working on fun and festive crafts and dress up your home with Valentine cheer. Cheerful winter scenes painted onto windows are often seen in storefronts during the holidays, but window painting is surprisingly easy and inexpensive to do at home. Let your kids indulge their artistic whims, then wash it off easily when you are ready for a new design. Mix powdered tempera paint with dish detergent and a little water until the mixture is a smooth, paint-like consistency. Blend well, but try to avoid making suds. Paint hearts, cupids, candies and other lovey-dovey scenes on windows and let dry for about 10 minutes. To remove the paint, use a solution of equal parts water and vinegar and wipe the windows clean. Winter crafts can be meaningful as well as decorative. A paper chain adds color to a family room or playroom, and is not just for Christmas anymore! Cut the construction paper into small strips, about an inch wide and four inches long. On each paper strip, write the name of a loved one or a loving thought for the upcoming year. Talk about why these people or wishes are important to you as you work. Make a loop out of the first strip and tape closed. Loop the second strip through the first and tape. Continue doing this until you have a large chain long enough to hang on the wall or ceiling. 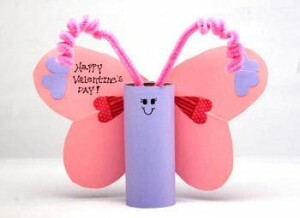 Courtesy of Kaboodle, this darling craft is the perfect Valentine for a family member or friend. Paint or cover an empty toilet tube with pink paper to make the body of the bug. Cut two hearts from construction paper. Attach these with tape or glue on either side of the body. Encourage your child to draw a face on the top of the tube. Pipe cleaners make great antennae.